This was a very interesting two-part live improvised session with Eve Risser on piano, Benjamin Duboc on bass and Edward Perraud on drums. The music is very spacious and the musicians use everything at their disposal to interact with one another and create some very interesting sounds. 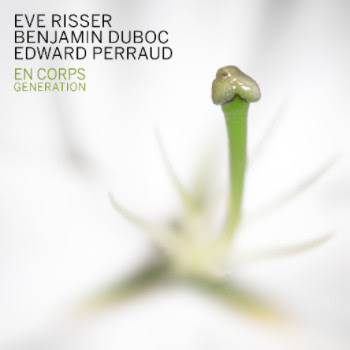 "Des Corps" is the first track on the album, and it is a very long collective improvisation, over thirty-seven minutes in length. The trio is playing at a very high level throughout the performance, with Risser making use of the length and breadth of the piano, playing in the standard manner and using extended techniques to increase the music making opportunities available to her. It is interesting to listen to the bass and drums interface with the piano, with bowing and scraping and fractured beats and rhythm allowing the music to develop organically, with the interaction between the instrumentalists coming in an unforced and original manner. Things get even more interesting on the concluding track, "Des Âmes" where the music grows darker and much more intense. The piano, bass and drums develop a storming collective improvisation which incorporates some slashing drumming, arcing and buoying bass playing and thunderous squalls of notes and chords from the piano. The trio really goes for broke here, complementing each other very well, and allowing the music to develop as a complex and multi-layered thing that nearly takes on a life of its own, leading to some exuberant and aggressive interplay between piano and drums with the bass riding point. The three players encourage one another on to greater exploratory heights with strong musical technique on ready display. The music develops various hues throughout the performance with dark and ominous sounds giving way to rays of sunlight as the improvisations develop and the musicians explore a wide open soundscape, culminating with a lengthy round of well deserved applause from the audience. This was an enjoyable and very well played album, and should be of particular interest to fans of European free improvisation. En Corps Generation - Dark Tree Records.